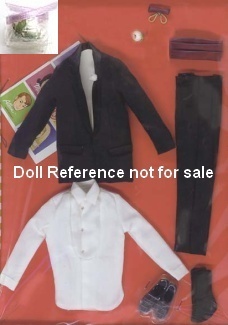 The flock haired Mattel Ken doll first came on the market in 1961 as Barbie's man; he's 12" tall and he too has a great wardrobe of tailored suits and sports outfits so he can accompany Barbie in style. 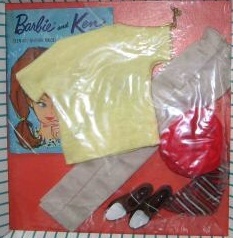 Ken had nine outfits to choose from in 1961, plus his original red swimsuit. 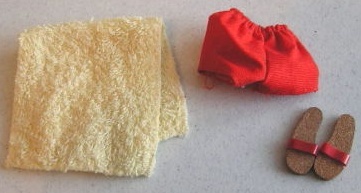 Original solid red cotton swim trunks, yellow terry cloth towel and red strap with cork soles sandals. Swim trunks with white braid stripe down sides have been found. 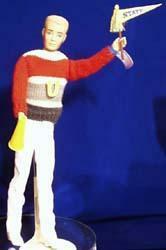 A wool multi colored pullover sweater in off white, red, light gray and darker gray stripe with a yellow felt "U", (if he's got a white trimmed with red border "M" felt initial then it's from 1964) on front, white duck zippered pants 6, red knit socks and white loafer shoes. He's waving his yellow "State" pennant. 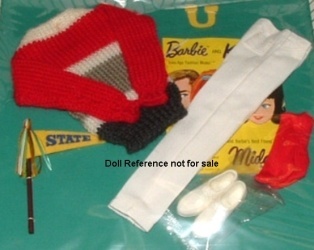 A white tee shirt with mock turtleneck collar, red and white polka dot boxers and white nylon briefs, pair of black plastic dumbbells and a green "In Training" book. 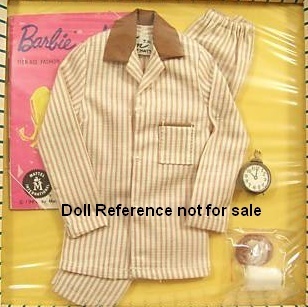 Brown and white striped cotton two piece pajamas, with a tailored shirt has contrasting solid brown collar and pocket trim, three white buttons with snaps underneath for closure, pull on elastic waistband brown stripe pants, a brass alarm clock with the time of "10:00 P.M.," a honey wax bun and clear plastic glass with white painted "milk". 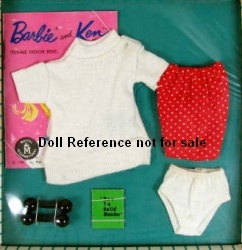 This set was made in Blue stripe for 1964 only. 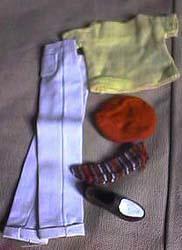 Yellow knit pullover collarless shirt, white duck zippered pants, striped knit socks and brown shoes with white painted tops, his red cap, two brass keys with a "K" monogram on a chain (also found in Rally Days). 0782 Casuals 1964 - changed the shirt to a striped knit shirt, rest of outfit the same, added a zero to the outfit number. 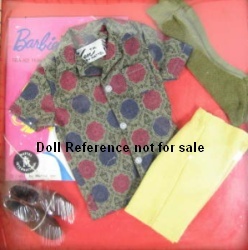 Olive tailored short sleeved shirt with a red, navy pattern, three white buttons with snaps underneath for closure, yellow khaki zippered shorts, olive knee-high knit socks and solid brown shoes. 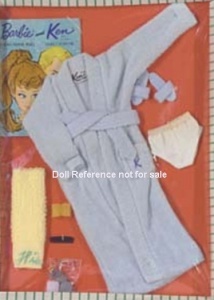 Light blue terry cloth robe with "K" monogram on front pocket and matching tie belt, white nylon briefs, blue terry cloth slippers, gray plastic razor, pink bar of soap, yellow towel with "His" monogram, blue sponge and black comb. 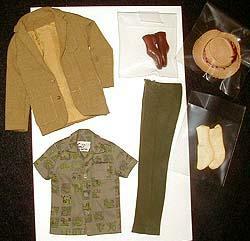 Olive green fully lined tailored jacket with three front pockets, green and gray print short sleeve shirt, dark green zippered pants, yellow knit socks, solid brown shoes and a straw hat with apricot and black hatband and red feather accent. 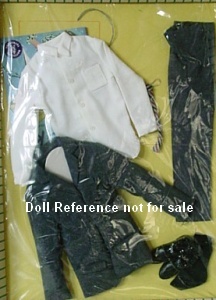 Dark gray two piece tailored suit; jacket fully lined, three button closure, two exterior pocket flaps and a white handkerchief in the top breast pocket, gray zippered slacks, long sleeve white shirt, rep striped tie (from open Road 985), black knit socks and solid black shoes. Classic black tuxedo; jacket is fully lined, one button closure, two flap pockets, black satin lapels with a white boutonnière, white tuxedo shirt with inset front has three pearl buttons, black zippered pants with satin stripe down each side, black knit socks, solid black shoes, maroon satin cummerbund, burgundy bowtie, a white fabric flower corsage for Barbie, in a clear plastic box.